This Chinese man is being pulled in two directions by two opposing political parties. 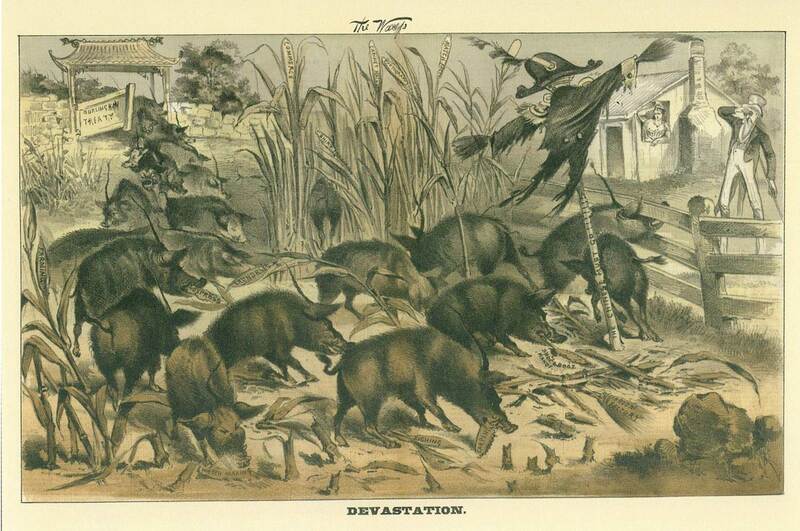 Typical of most Nast drawings, the bad is on the left, the good on the right. The party figures also represent their regional power base -—the West for Democrats and the East for Republicans. We do not know from what location the Chinese man is standing or how he arrived at this particular tug-of-war predicament. Rare for Nast, there is no detail as to location, no props to suggest a political issue or visual guides to suggest how one might think about the Chinese man’s unfortunate situation. He is is simply being pulled apart. 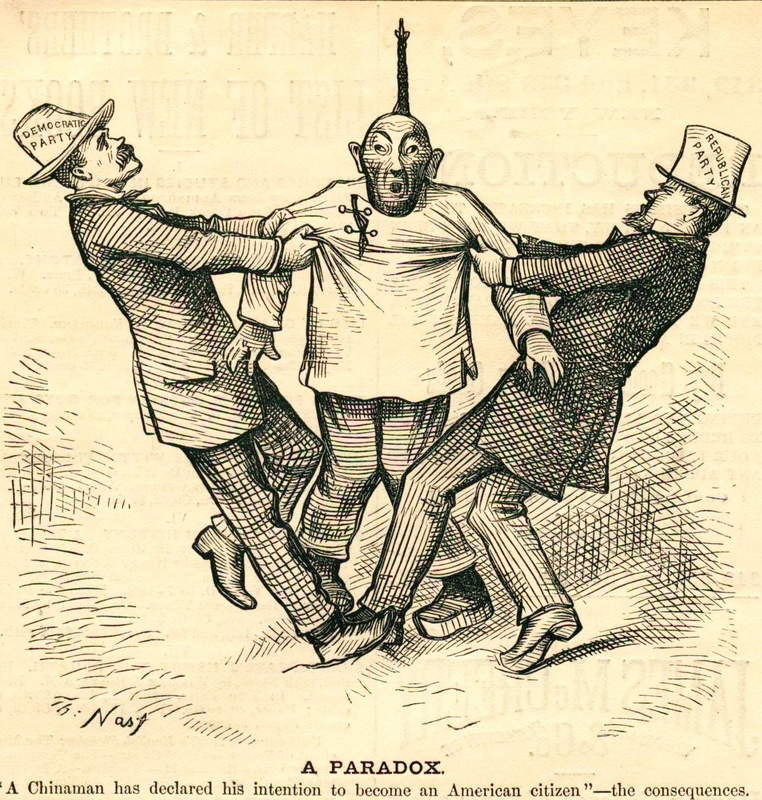 On the right, the Republican Party, and particularly the Radical Republicans to whom Nast aligned and identified, wanted the Chinese to remain in the United States and argued for their admittance for American citizenship. 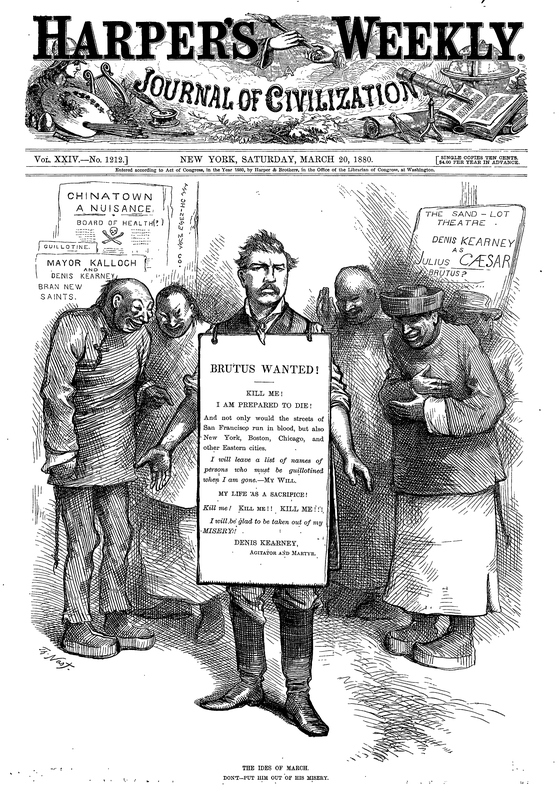 Radical Republicans stood first and foremost from a position of morality and believed that the Chinese were no different than any other immigrant group. Mainstream Republicans and those Republicans whose constituency represented business, industry and capitalism, wanted the Chinese to remain. Good workers were good for business. Capitalists admired the hard working, non-striking Chinese and fiscally benefited from their industriousness and productivity. Ideal employees, the Chinese kept to themselves and completed their work. Chinese went where work was offered and perhaps unknowingly, served as pawns to break strikes, drive down labor costs and inflame white workingmen’s charges of coolie or slave labor. break strikes and drive down labor costs. Democrats in the South also wanted the Chinese to teach newly freed African Americans a lesson. Plantation owners in the Deep South also looked to punish African American labor and reduce dependance on black labor’s earning power by encouraging immigrant labor that included the Chinese. One Alabama newspaper appealed to Irish and German immigrants to earn $10 a month on the farms. “Even more attractive were indentured laborers from China, whose “natural” docility would bolster plantation discipline and whose arrival, by flooding the labor market, would reduce the wages of blacks” (Foner 419). Democrats along the West Coast however, wanted the Chinese driven out all together. As Euro-American populations increasingly traveled west, any Chinese earning money was seen as competition — as the enemy. 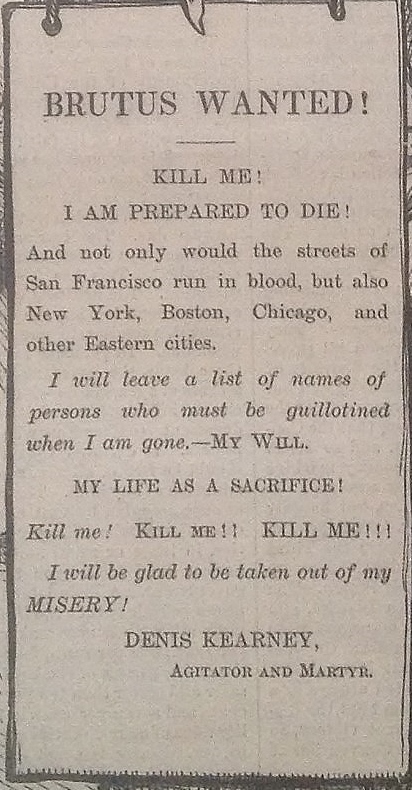 This view took on an even greater urgency during the economic crash of the late 1870s. The Chinese man central in this cartoon is confused and startled. His queue stands up straight like an exclamation point in reaction to the tug of war over his person, his talent, and his future. He is both a prize of labor and a future victim. Representing the average Chinese worker, he has nowhere to call home, no political party with whom he could place absolute trust. The Chinese were prohibited from becoming citizens in the United States and could not vote. This prohibition did not extend to any other immigrant group. By 1880, some Republicans like James G. Blaine aligned less with pro-business and bent under the populist pressure to rid the country of the purported Chinese threat. Republican presidential hopeful James G. Blaine was all too aware that Nast’s sphere of influence on the electorate was wide. Nast relished exposing Blaine’s hypocrisy and anti-immigration stance. East Coast, New England tolerance toward accepting newcomers had been a point of Republican pride. Blaine was the first Republican official to defect to the Democratic way of thinking. Nast’s fixation on Blaine was unrelenting, and nearly equaled his Tweed/Tammany days. The attention worried Blaine, who “attempted to explain and to justify his position, but the artist could see in the Chinese immigrant only a man and a brother, trying to make a living in a quiet and peaceful manner in a country that was big enough for all” (Paine, 413). Nast’s Blaine’s Teas(e) shows the dilemma the politician faced. The Evening News Blaine reads, chronicles the West Coast’s growing calls for “The Chinese Must Go.” A savvy politician, Blaine needed votes in the West. All the while working to undermine the legitimacy of Chinese Americans, Nast lets Americans see that Blaine enjoyed the teas and porcelains resulting from U.S. trade with China. Nast calls out hypocrisy and incongruity of admiring Chinese “things” but hating the source of the objects. The clammy Chinese figure rising before Blaine’s conjures the haunting, ethereal quality of ghosts who confront Dickens’ Scrooge. Whether Dickens’s spirits were an inspiration is unknown. Blaine is visited, in this instance, by a hot steamy specter who rises up from Blaine’s teacup to scold and confront the politician. This apparition will not allow Blaine to enjoy his tea in peace and privacy. Blaine’s hair appears to rise in alarm, but Blaine looks more annoyed that fearful. His right hand has gripped the paper suddenly, indicating he is unnerved, yet he continues to clutch at his truth as he comes to terms with what is before him. 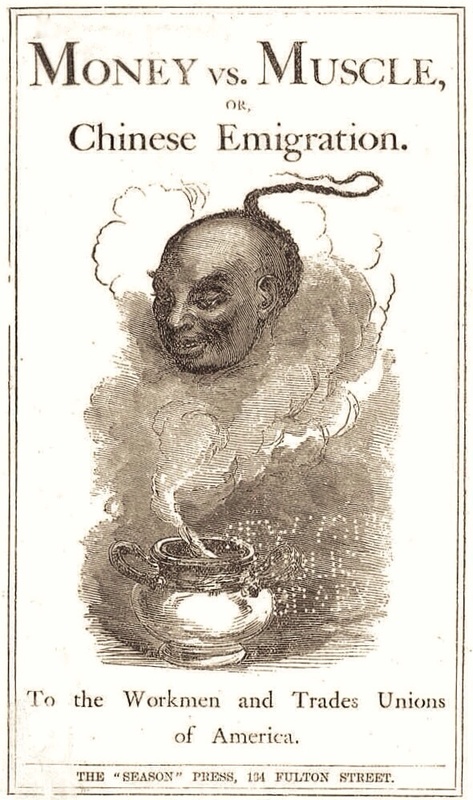 Otherworldly, and celestial, the Chinese tea ghost peers directly into Blaine’s eyes with and bears a stiff upper lip. Nast’s ghost intrudes, haunts and teases Blaine with the reality of the politician’s actions and xenophobic policies. 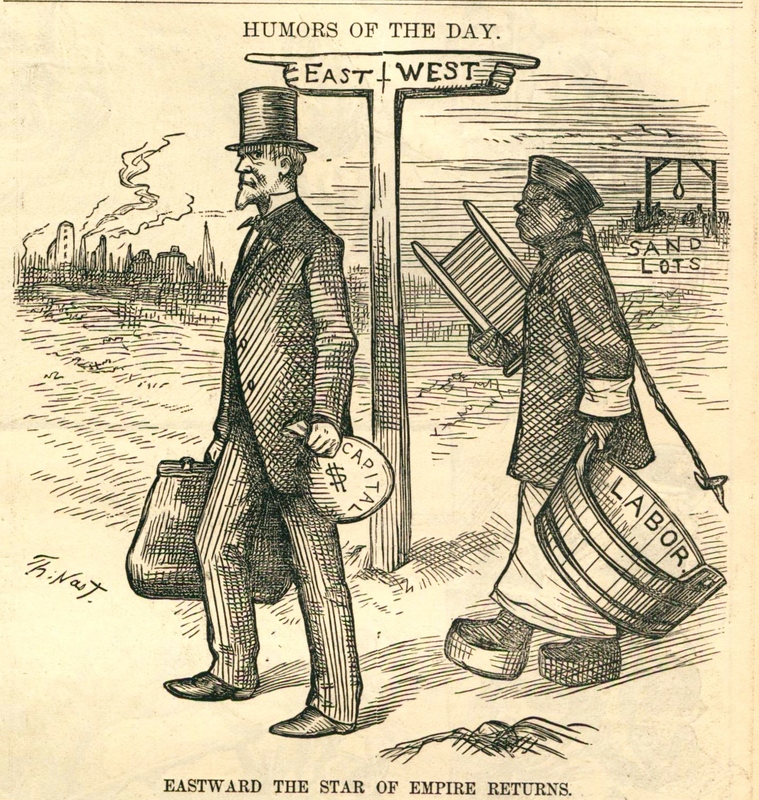 Nast challenges the worthiness of Blaine’s Republican ideals – his obligation as a member of Lincoln’s Party to tolerate newcomers to the United States. Nast confronts a reality that Metrick-Chen continues to wrestle with and unpack in her book. Throughout America’s earliest history, spanning across Nast’s era and well into the twentieth century, American and Western culture held a fascination with exotic Eastern objects and artifacts. Blaine wants to enjoy his Chinese tea from Chinese porcelain. He embodies exactly the kind of person who collects objects but excludes people. Nast reminds his audience, and Blaine, that the Chinese people created these cherished goods and services. Blaine deserves to be haunted by his hypocrisy. Nast’s idea for this cartoon, however, may not be original. A “spectral disembodied head emerges from a magic lamp” in John S. Cook’s 1870 illustration of Money vs.Muscle, or Chinese Emigration. To the Workmen and Trade unions of America, published by the Season Press. 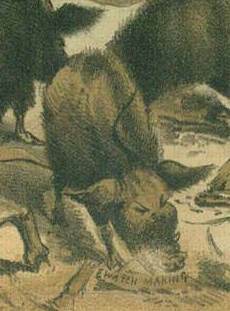 It is not known if Nast had access to the book. The images are strikingly similar. Metrick-Chen writes that soon after the United States was formally recognized as a country under the terms of the Treaty of Paris, the U.S. eagerly entered into trade with China. 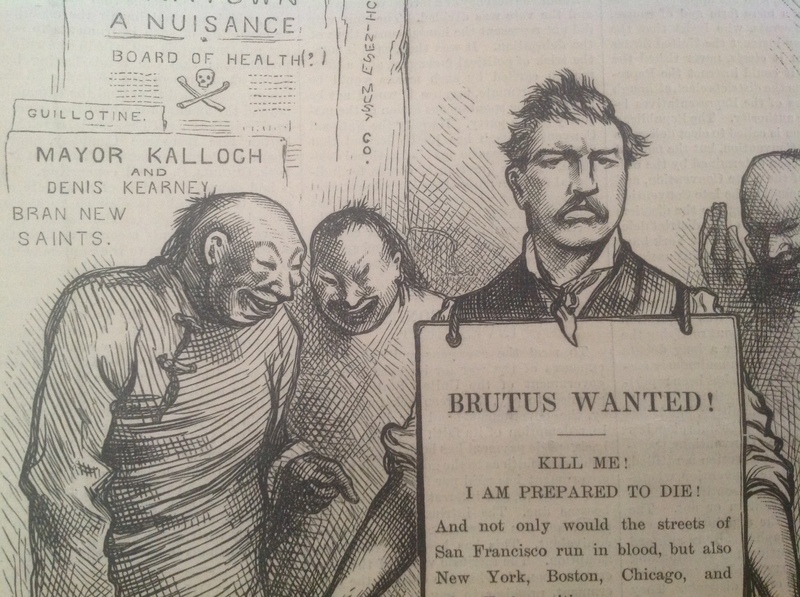 “The predominant American view of the Chinese had been laudatory” (19). With the conclusion of The Opium War (1839- 1842), American superiority (Manifest Destiny) grew. Reports from Protestant missionaries stationed in China relayed to the American people their unsuccessful attempts to convert the Chinese to Christianity. These reports making their way home factored in supplanting favorable views toward China into negative opinions (Metrick-Chen 21-23). 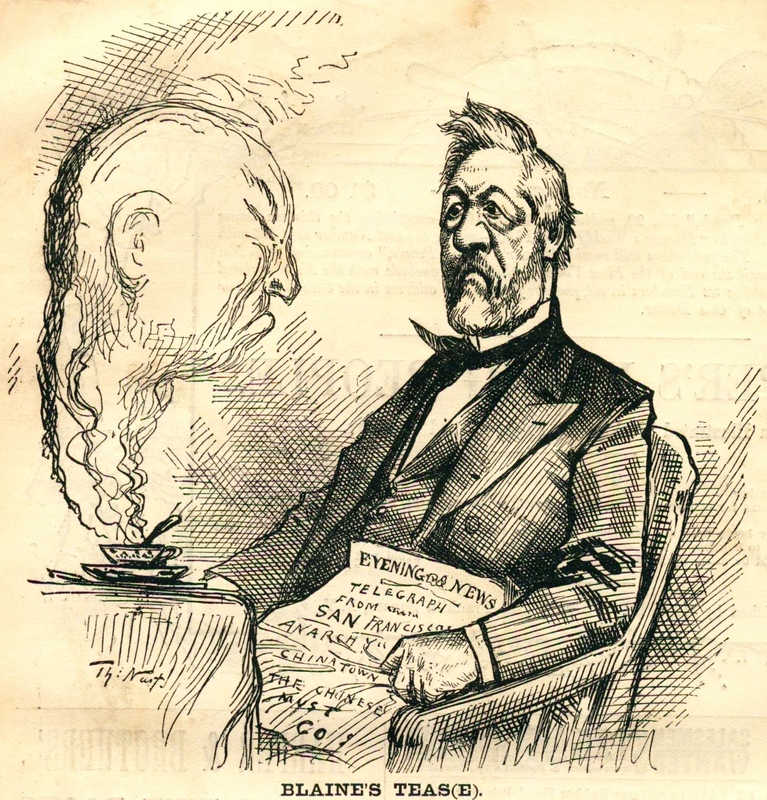 Defining Chinese as non-Christian heathens was an important element in disqualifying them as competitive laborers and applicants as citizens and visitors to the U.S.
On the eve of the 1880 Republican convention, Nast introduced one of his favorite targets, James G. Blaine, as a”magnetic man “who had attracted many undesirable political features” (Paine 425). Nast dehumanizes Blaine by removing his human form (with the exception of his face) . 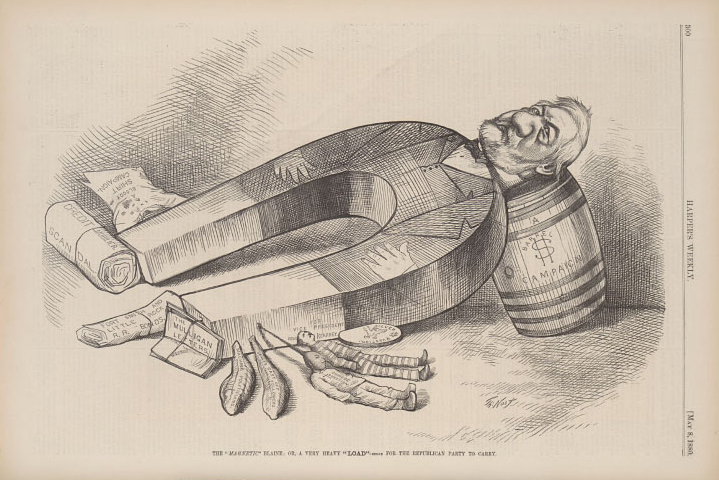 Blaine’s head rests upon a barrel of campaign funds. Nast reintroduces the “Mulligan letters” scandal of 1876 which had cost Blaine the presidential nomination. His personal magnetism draws close to Blaine references of past issues:“A Bloody Shirt Campaign,” Credit Scandal,” “Fort Smith and Little Rock R.R. Bonds,” The Mulligan Letters,” “Machine Politics,” “Grant’s Cast Off Followers.” Center to the drawing, a Chinese man lies lifeless, a metal clip at the end of his queue affixed to the magnet. Next to the Chinese, a man in prison stripes rests his head along a declaration, “For Vice President Denis Kearney” and lastly a silver dollar, acknowledging a controversy about using silver as currency. As a magnet of dubious attraction, Blaine is also rendered ineffective. His torso is missing. He has lost is manhood – his originality and bravery are neutered. At the end of his magnetic legs, Blaine’s feet are missing, disabling the presidential hopeful to take a moral stand His hands are flat and immobile at his side. Blaine is, in effect, paralyzed by his past positions, and is unable to disassociate or break the hold of his scandalous and immoral past. As Morton Keller has observed, with Grant no longer in the political arena, Nast lost his sense of passion for Republican personalities and his perception of their shift away from the moral compass where social issues were concerned.